Yesterday, Bam decided to apologize for what happened and make it clear he would never hurt an animal. 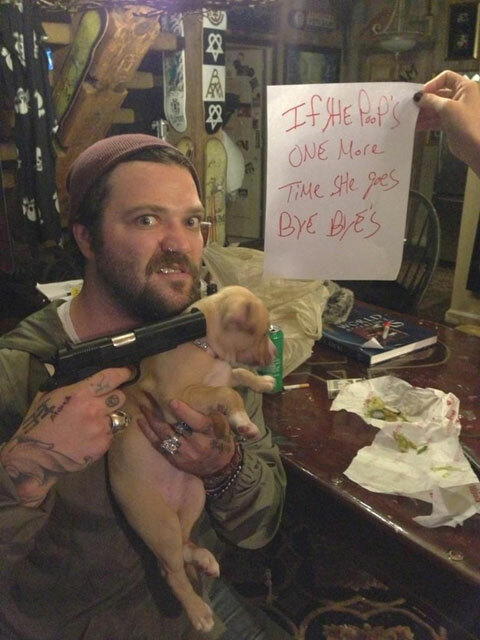 Speaking to the Philadelphia Inquirer, Margera said he wouldn’t have posted the picture if he’d known about the recent animal abuse cases. He owns six cats and a dog and would never do anything to hurt them, though he thinks his followers should know that by now. ”I feel like every follower I have on Twitter knows my Jackass joking kind of humor." Clearly, more than a few of Bam’s followers were genuinely concerned, not so much for the safety of the humans with guns to their heads but for the safety of the animals. In the future, one would imagine Margera will stay away from tweeting anything that could be misconstrued as animal abuse. There’s just no point in dealing with the backlash in order to make a mildly amusing joke.